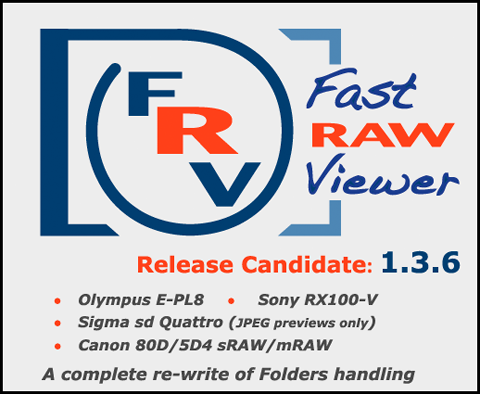 We added Folders panel to FastRawViewer starting with version 1.1, that is one and a half years ago. This addition significantly simplified the navigation. The 3rd-party components we were using for that purpose have a problem (fortunately, affecting only a very minor number of FastRawViewer users), namely, if the nesting level of folders is too high a crash may occur. Among those few cases encountered, more reports came from OS X users, and mostly when the raw files were located on network volumes. We were unable to reproduce the issue in our own tests in any consistent manner, "it all worked for us". During those one and a half years we learned how to get around the problem, most cases were resolved through the hidden setting SimpleFoldersHandling, which switched off some of the advanced features like removable media monitoring and detection of new folders. The rest of cases was solved when 'DisableFoldersOnStart' hidden setting was applied, this one switched off the Folders panel. Version 1.3.6 includes a complete re-write of Folders handling routines, and hope it solved the problem. In our tests we were unable to crash FastRawViewer at all (previously we were occasionally able to cause the crash); and the problematic pieces of code that caused the issue are totally eliminated from the project. However we are not sure all of this issue is addressed and ask you for additional testing. New bottom bar setting 'Selected files count' (off by default). Sony-E cameras: if lens connected via dumb adapter, Lens: unknown is shown in EXIF Lens info. Adobe Photoshop CC 2017 added to list of automatically found programs (on first FRV start). If focal length recorded in EXIF data is 0mm, no Lens: 0mm shown in EXIF table. OS X: removed an unnecessary check of OpenGL version; this check was disabling FastRawViewer on 2006 MacMinis. File/folder drop in main program window works in all cases. Fixed handling of Fuji X-Trans compressed files with incorrect data size tag in metadata. Restored 'Read XMP blocks from RAW', was broken in early 1.3.6 builds. 'Flash was used' icon in EXIF summary string (EXIF panel and bottom bar) resized correctly after interface font changed. Fixed problem with Sony SR2 metadata parsing. If you are still experiencing, or started to experience, any crashes, please send us the crash reports (see instructions how to do that).